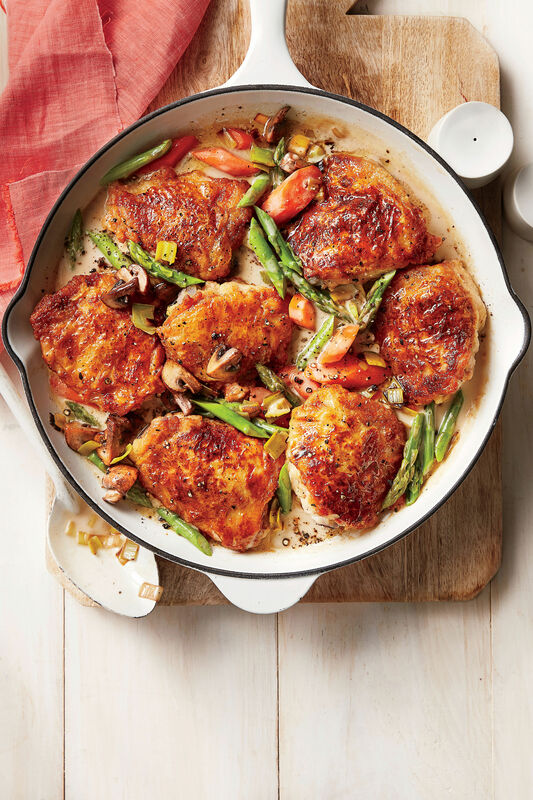 Chicken, the weeknight crowd-pleaser, is the star of these recipes that all use just one pot, pan, or skillet. From chili to jambalaya to pot pie—these easy recipes are anything but boring. This creamy, dreamy chicken dish is tasty enough for company and quick enough for a weeknight. Everyone will want seconds of this 30-minute meal. There’s nothing boring about this chicken dinner. 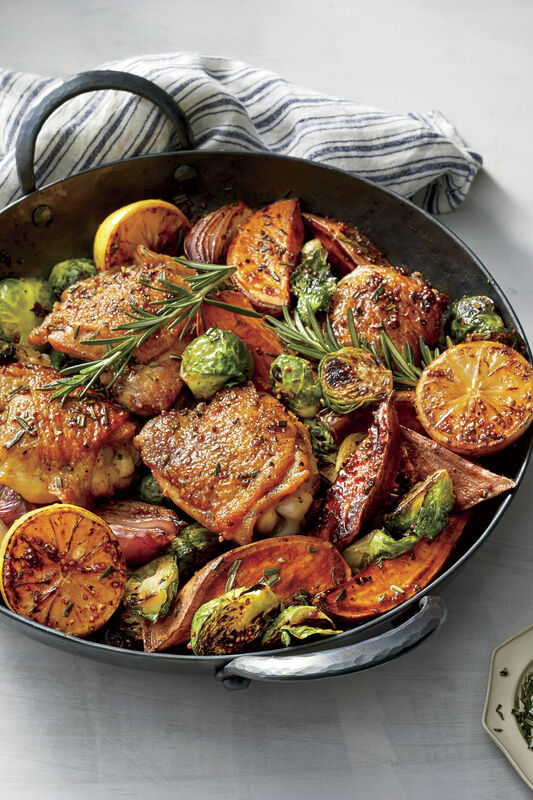 Flavorful Mediterranean ingredients come together in a delicious, one-dish chicken dinner that your whole family will love. This savory chicken recipe tastes like it has been slow cooking all day. In less than an hour (and only 10 minutes of hands-on time) you’ll have this company-worthy dish on the table. This spring chicken recipe showcases some of the season’s best flavors like carrots, leeks, and asparagus, all smothered in a delicious cream sauce. As your butcher to remove the chicken’s backbone—a technique called spatchcocking (or butterflying) to save yourself the hassle. Be sure to ask the butcher to wrap the backbone up for you. It makes great chicken stock. A simple vinegar mixture dresses up chicken sausage, fennel, apples, and rice. The carrots and onions cook below the chicken creating a delicious, caramelized flavor. This crispy, crunchy sheet pan supper is going to be a winner with your weeknight crowd. The ingredient list is simple, but the flavor is anything but. This savory one-pot meal is full of tasty ingredients like quick-cooking basmati rice, onion, celery, carrot, garlic, collard greens, and Cajun smoked sausage. Skip your favorite order-at-the-counter Tex-Mex joint and whip up this savory chicken bowl at home in no time. We opted to replace leafy greens with springtime asparagus in this salad recipe. You’ll love the tangy Lemon-Buttermilk Dressing. You can customize this recipe to make it your own by substituting sausage for chicken, crabmeat for shrimp, or opting for a vegetarian entrée by using vegetable stock and skipping the proteins. Everyone’s favorite casserole is a lot easier (and made with just one pan!) thanks to precooked smoked chicken. A tangy gravy that gets a big hit of flavor from county ham and mushrooms makes this skillet recipe a homerun. This reader-favorite is the ultimate one-dish dinner recipe for entertaining. Serve with a crusty French bread to soak up the delicious pan sauce. You’re going to love the way we kicked up a traditional Caesar salad by jazzing up store-bought dressing and charring Romaine lettuce. Two kinds of sausage (fresh pork sausage and Andouille) go into this savory one-pot meal. It takes just under two hours to make our Creole Seafood Jambalaya but, we assure you, it’s worth the wait. You won’t need to roll out piecrust dough when you’re using our easy Skillet Chicken Pot Pie recipe. Just prepare the filling, pour into your favorite cast-iron skillet, and top with refrigerated piecrust. 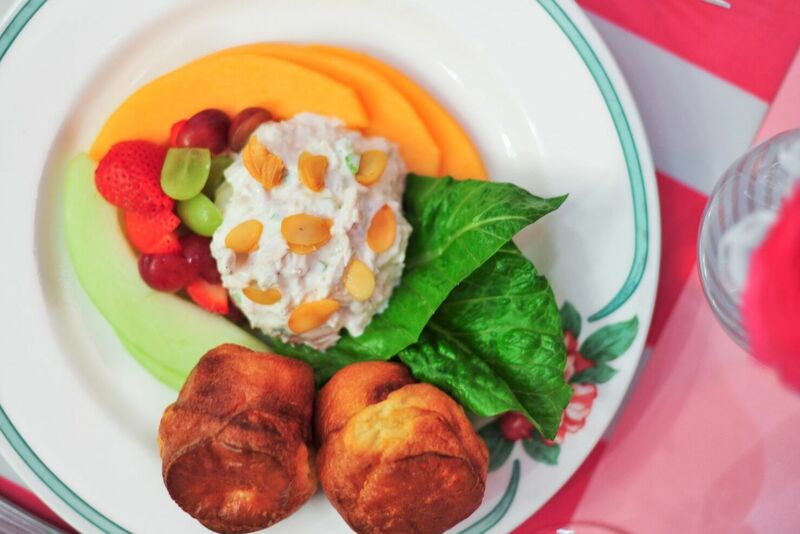 If you thought chicken pot pie couldn’t get any tastier, think again. 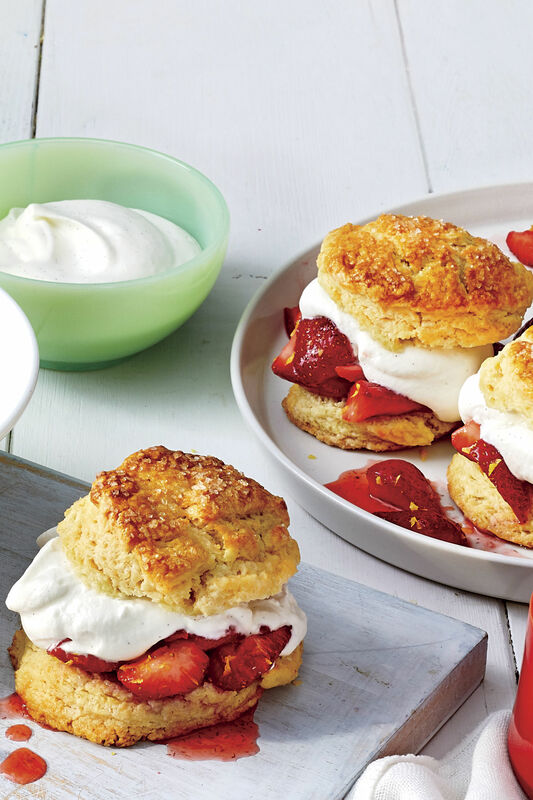 Homemade biscuits kick up the flavor in a delicious way. Two of the South’s favorite casseroles are morphed into one delicious dish with our King Ranch Chicken Mac and Cheese recipe. There’s a reason this chili is called White Lighting—it comes together in only 30 minutes. Quick-cooking chicken cutlets are the star of this recipe that comes together with just 20 minutes hands-on time (30 minutes total).